Thank you so much for your letter regarding regulating cab drivers in the Abiquiu area. As you know, there are many opposing views on this issue, which has been discussed repeatedly in village council meetings. It appears that the lunch lady at Abiquiu Elementary has been moonlighting as a cab driver for some four months now, and doing this without a cab driver’s license. 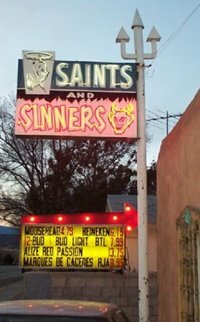 This has greatly upset Juan Bob Lucero Ortega C de Baca y Pino, who has driven Abiqui’s only cab since 1981, when he first took Georgia O’Keeffe from Ghost Ranch to the Saints n Sinners bar just outside of Española. Of course, it is true that Juan Bob also doesn’t have a license, but it is his position that he is grandfathered in, and that Cleofila Zamora Gallegos Aragón is just butting in to take business away from the family of her daughter-in-law’s ex-husband, since they have taken the chile roasting business away from Severo and Chupo Herrera. We appreciate your input and will consider all opinions at next Tuesday’s council meeting. A vote is expected on the issue by the end of the evening, after all input is taken into consideration. Council members Gallegos, Zamora, Aragón and C de Baca are expected to attend. Again, thank you for your input. The council works for you.